Waterfall relies on teams following a sequence of steps and never moving forward until the previous phase has been completed. The methodology, in its traditional form, leaves almost no room for unexpected changes or revisions. If your team is small and your projects are predictable, then Waterfall could provide the ideal framework. If you’ve researched project management methodologies before, the Waterfall methodology has probably come up. On lists of popular, trusted project management methodologies, Waterfall sits comfortably among agile, Scrum, Six Sigma, and Kanban. Dr. Winston Royce first defined the methodology in 1970 in a paper about inefficiencies in large software development projects, but no one is credited for individually creating the methodology. Almost half a century after it was identified, Waterfall still has relevance in the modern business world—but it shouldn’t be used indiscriminately. 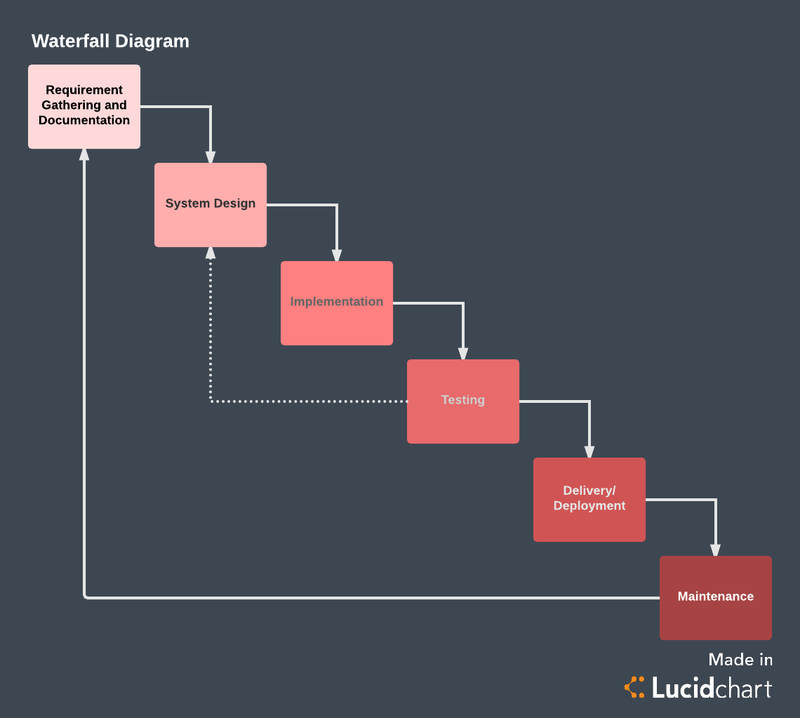 Read on to learn more about the advantages and disadvantages of the Waterfall model and to see how Lucidchart can help you and your team apply it to your next project. Waterfall relies on teams following a sequence of steps and never moving forward until the previous phase has been completed. This structure is suited to smaller projects with deliverables that are easy to define from the start. Ben Aston from The Digital Project Manager explains, "Waterfall is generally regarded with some disdain as an inefficient and passé traditional project management approach. But Waterfall can be a useful and predictable approach if requirements are fixed, well documented, and clear, if the technology is understood and mature, if the project is short, and if there’s no additional value gained from 'going agile.' A Waterfall approach can actually provide more predictable end result for budget, timeline, and scope." Here’s an in-depth look at what the Waterfall methodology does best. Teams must complete an entire step before moving onto the next one, so if there are roadblocks to completion, they’re brought to light right away. Half-finished projects are less likely to get pushed aside, leaving teams with a more complete, polished project in the end. In addition to being clear, the progression of Waterfall is intuitive. Unlike Six Sigma or Scrum, Waterfall does not require certifications or specific training for project managers or employees. If you visually outline the process at the beginning using Lucidchart and explain the methodology, team members will be able to jump into the Waterfall system without a steep learning curve slowing their progress. One of the defining steps of Waterfall is committing to an end product, goal, or deliverable at the beginning, and teams should avoid deviating from that commitment. For small projects where goals are clear, this step makes your team aware of the overall goal from the beginning, with less potential for getting lost in the details as the project moves forward. Unlike Scrum, which divides projects up into individual sprints, Waterfall keeps the focus on the end goal at all times. If your team has a concrete goal with a clear end date, Waterfall will eliminate the risk of getting bogged down as you work toward that goal. Waterfall’s approach is highly methodical, so it should come as no surprise that the methodology emphasizes a clean transfer of information at each step. When applied in a software setting, every new step involves a new group of people, and though that might not be the case at your company, you still should aim to document information throughout a project’s lifecycle. Whether you’re passing projects off at each step or experience unexpected personnel changes, Waterfall prioritizes accessible information so new additions to the team can get up to speed quickly if needed. You can maximize your benefits from this characteristic of Waterfall by staying organized with the right process. Use Lucidchart (it’s free to sign up!) to document processes so each team member knows what has already been done on a project when it gets to them. Waterfall is a respected methodology, but lately it’s faced criticism for being an outdated model. The methodology’s limitations become more apparent depending on the size, type, and goals of the project it’s guiding. Rather than adapting your organization to Waterfall’s guidelines later, consider these limitations to assess whether Waterfall is truly a fit for your team. Waterfall is based entirely on following a set of steps that keep teams always moving forward. The methodology, in its traditional form, leaves almost no room for unexpected changes or revisions. If your team has loyally followed the steps of Waterfall nearly to the end of the project but then faces an unplanned roadblock that necessitates a change in scope or goals, pivoting won’t be easy. You’ll have put a considerable amount of work into a project under very specific, rigid assumptions. A sudden change to the parameters of the project could render much of the work you’ve carried out up to that point useless, which can throw off the entire timeline. If your team’s projects are unpredictable or involve frequent change, consider adapting Waterfall to allow more room for reflection and revision as you go, rather than just at the end, to prevent wasted time and energy. If you decide to go this route, tailor a Lucidchart template to your team’s version of Waterfall to keep everyone aware of how to use the adjusted process. As an internal process, the Waterfall methodology focuses very little on the end user or client involved with a project. Its main purpose has always been to help internal teams move more efficiently through the phases of a project, which can work well for the software world. However, if you work in an industry other than software, clients often want to be involved during a project, adding opinions and clarifying what they want as the project moves forward. If your projects have clear, unchanging goals from the beginning and you aren’t responsible for updating end users or clients through the development process, then Waterfall will probably work well for your team. In other cases, consider an agile methodology to better anticipate change and keep stakeholders informed through the life of the project. By involving stakeholders, you lower the risk of late requests for change throwing off your project deadlines. Saving the testing phase until the last half of a project is risky, but Waterfall insists that teams wait until step four out of six to test their products. Outside of the software industry, the testing phase could mean showing a new website design to a client, A/B testing content, or taking any number of steps to gain empirical data on the viability of the project. At this point, the project has likely taken considerable time to complete, so large revisions could cause significant delays. The agile methodology was created in direct response to this principle of Waterfall. Critics of Waterfall felt that there was too much room for problems to remain unnoticed until the project neared completion, which left large, costly changes as the only solution. If you feel that frequent testing would serve your team better, implement testing at the end of every project stage so that you don’t move forward until you know things are working. Or consider a different project management methodology that encourages reflection and revision throughout the process. The Waterfall methodology has had critics and supporters since its inception, but it remains relevant today even as other methodologies have evolved to account for many of its flaws. If your team is small and your projects are consistent and predictable, then Waterfall could provide the ideal framework for keeping your team organized and on track. If not, don’t be afraid to customize a project management methodology to make it right for you. With Lucidchart, you have free rein to create a structure that will work best for your team and its unique needs. Track your Waterfall process or any methodology you choose. Sign up for Lucidchart today!